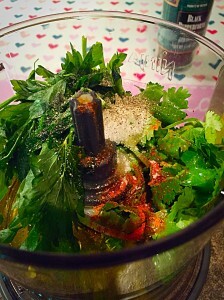 Place all ingredients except meat into a blender or food processor. 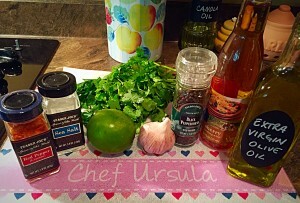 Tip- Your sauce will blend more easily if you add garlic first, then greens, then remaining ingredients. 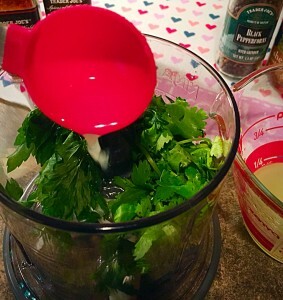 Blend/process until the sauce is almost pureed. Leave a bit of texture. It will stick to the meat better. 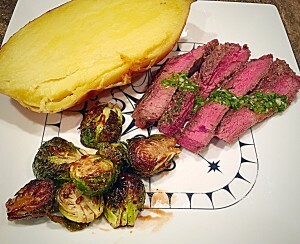 Half will be reserved to top the meat with. 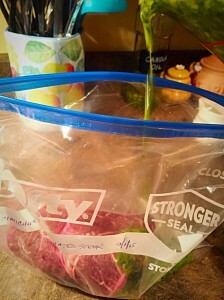 Place meat into gallon sized freezer bag. Pour ½ of the sauce into the bag with the meat. 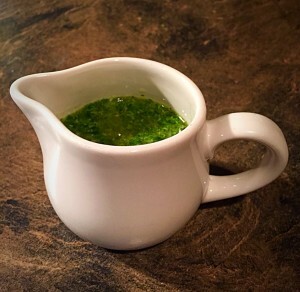 Zip it up and give it a good massage to get all of the delicious Chimichurri flavor all over the meat. 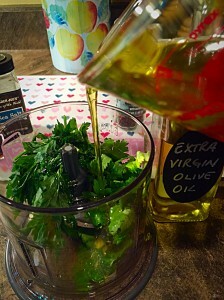 Refrigerate for at least one hour, up to 24 hours (the longer it marinates, the better flavor it retains). Refrigerate the remaining sauce. Preheat an outdoor grill to medium-high heat. 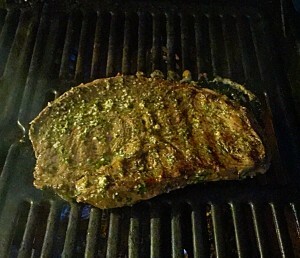 Remove the meat from the bag, and place on the preheated grill. 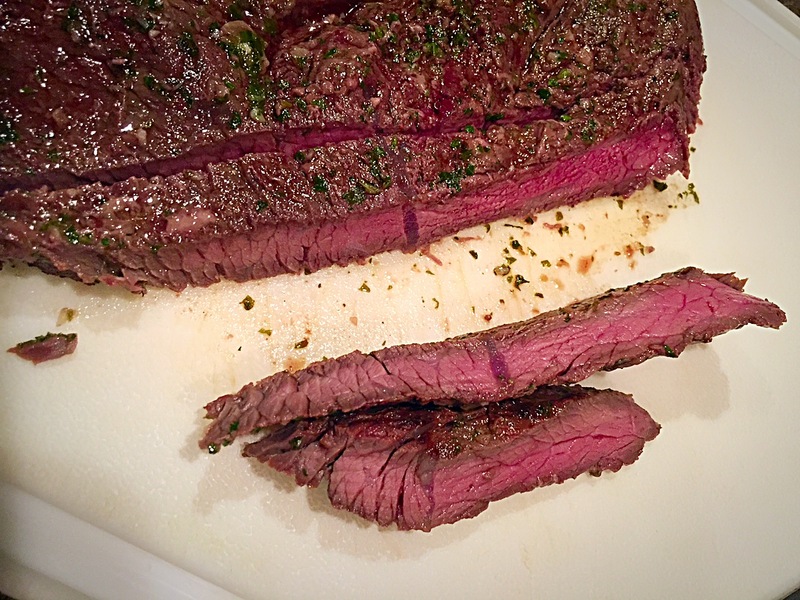 For medium-rare, cook for @ four minutes on each side. Remove remaining sauce and set aside. Remove meat from grill, place on a platter, and cover with aluminum foil so it can rest for @ 10 minutes. Slice against the grain, into @ ½” wide strips. Spoon some of the reserved sauce over the meat, and enjoy! 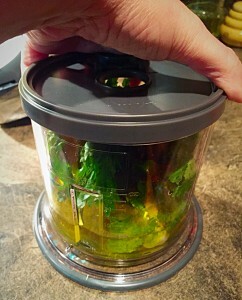 Place all ingredients except meat into a blender or food processer. 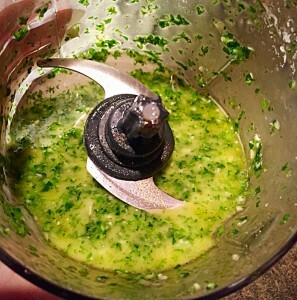 Blend/process until the sauce is almost pureed. Leave a bit of texture. It will stick to the meat better. Half will be reserved to top the meat with. Place meat into gallon sized freezer bag. Pour ½ of the sauce into the bag with the meat. 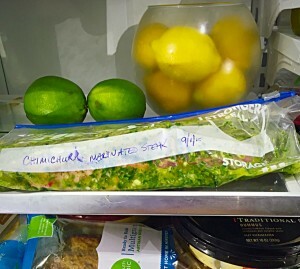 Zip it up and give it a good massage to get all of the delicious Chimichurri flavor all over the meat. 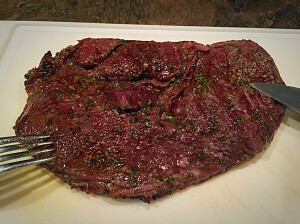 Remove the meat from the bag, and place on the preheated grill. For medium-rare, cook for @ four minutes on each side.